Most travel insurance policies don't cover your hard earned miles and points. Here are three that do. Even though your miles and points are as good as cash to you, most travel insurance companies don’t see it that way. The vast majority of policies explicitly do not cover frequent flyer miles or points. Why does this matter, you ask, when most award bookings can be cancelled? In these cases, you’re going to want to get travel insurance that covers your miles and points in the event you can’t travel. Here are some general principles governing all policies. It seems almost silly that I have to say this, but if your travel insurance does cover miles and points, claims can only be made if you can’t travel for a covered reason. That’s to say, you can’t just change your mind about traveling and expect to be compensated (exception: Aviva’s “trip cancellation for any reason” feature, see below). Look at the “trip cancellation” section of your insurance policy and see what “insured events” it covers. This typically includes situations like accidents or medical emergencies that prevent you from traveling. If one of these events causes your trip to be cancelled and your miles and points cannot be recovered, then yes, you can claim the value from your insurer. I mentioned at the start that there are certain situations where your miles and points may not be recoverable. However, in the vast majority of situations, they will be. Suppose you fall ill a week before your trip and can’t fly. 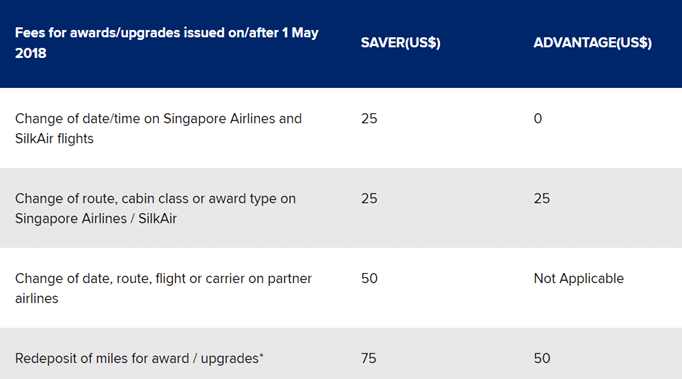 If you’ve booked a Saver award ticket with Singapore Airlines, you can recover your miles with a US$75 cancellation penalty. Since your miles can be recovered, no compensation is due (it’s worth a shot asking if your travel insurance can cover the US$75 cancellation fee). Similarly, if you break your leg one week before your vacation, but your hotel lets you cancel your award night without penalty up to 24 hours before check-in, you’re expected to cancel the reservation immediately and won’t be eligible for any compensation. For (2), I can only assume that the insurance company has some sort of internal valuation of miles and points that they use. I’m going to fall back on my usual 2 cents per mile valuation in this case as a best guess, although you’re going to want to check this with them when the situation arises. Here are the three policies I found which cover miles and points, and what each of them specify. tl;dr: Sompo covers your miles and points based on the lower of the retail price of the air ticket or miles. 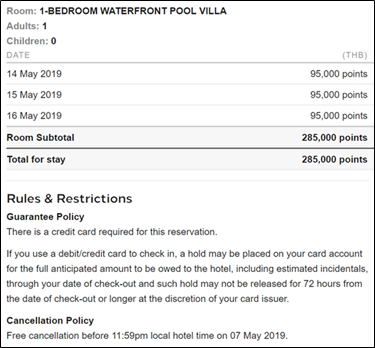 It’s worth confirming with Sompo whether this coverage extends to hotel points as well, because the policy doesn’t say so explicitly. If, during the Period of Insurance, the Insured Person purchase an airline ticket (or other travel and/or accommodation expense) using frequent flyer points or similar reward points and the airline ticket (or other travel and/or accommodation expense) is subsequently cancelled as a result of any Specified Cause (as defined in Section 15) and the loss of such points cannot be recovered from any other source, the Company will indemnify the Insured Person the retail price for that ticket (or other travel and/or accommodation expense) at the time it was issued up to the Benefit amount specified in the Certificate of Insurance subject to the terms and conditions of this Policy, provided always that this coverage is effective only if this Policy is purchased before the Insured Person becomes aware of any circumstances which could lead to the disruption of his Journey. Edit 25/02: Chubb’s wording seems to suggest that for your miles to be covered, you’ll need to redeem them after you purchase travel insurance. This isn’t so much an issue if you buy an annual travel insurance plan, but it’s worth noting if you’re buying a single trip one. tl;dr: Chubb covers your miles and points based on the retail price of the air ticket or accommodation. tl;dr: Aviva covers your miles and points based on the retail price of the air ticket or accommodation. 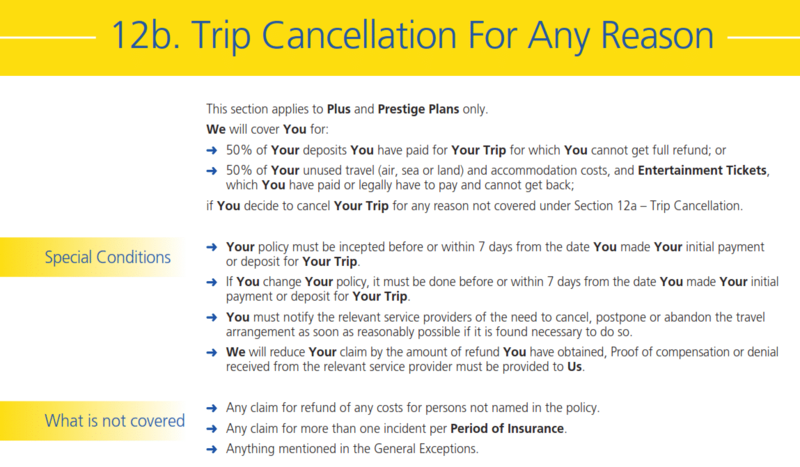 One interesting thing about Aviva’s travel insurance is the Plus and Prestige plan have a “trip cancellation for any reason” feature, which covers you for 50% of your unused travel/accommodation costs which you can’t recover, capped at $5,000. This conjures an interesting scenario in my mind: what if someone were to redeem a Spontaneous Escapes Business Class ticket and then decides not to travel for “any reason”? Even with the $5,000 cap, 50% of the retail cost of a business class ticket to Europe would surely be much more than the cost of the policy. These were the three policies I managed to find that cover your hard earned miles and points. When choosing among these three, you obviously want to look at the policies in their entirety- medical expense coverage, emergency evacuation, rental car excess, the whole shebang. Great insights in this ariticle! I have a clarifying question – for the ‘trip cancellation for any reason’ under Aviva it says the policy, “must be incepted before or within 7 days from making the initial deposit or payment for your trip”. So does that mean that if I make an award redemption months in advance of my actual flight, within 7 days of the booking I should also buy insurance for the days covering that trip? Has anyone successfully gotten 4mpd from using DBS WWMC to pay Chubb’s My VoyageGuard premiums online? I have a question though… if the points can be recovered with a fee, the insurer simply pays for the fee but I’d have to find another available flight (on saver biz for instance) and it’s a problem if i’m already overseas and have to fork out of pocket for the return flight? Any thoughts on this? Thanks! 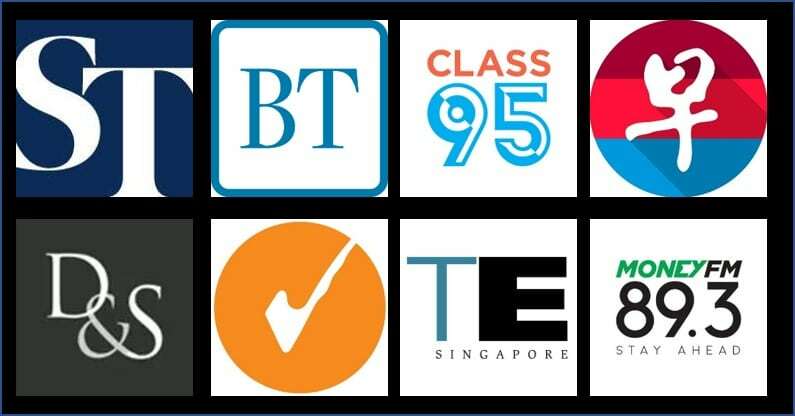 Previous Entry Accor Plus membership: what are the benefits and should you get one?